Heat oven to 400°F. Scrub potatoes; prick all over with fork. Place directly on oven rack. Bake 45 to 50 minutes or until easily pierced with fork. Remove from oven; let stand 30 minutes to cool slightly. Reduce oven temperature to 350°F; spray 13x9-inch (3-quart) glass baking dish with cooking spray. 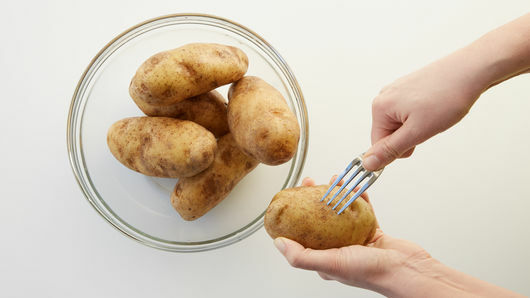 Cut baked potatoes in half lengthwise, scoop out insides to within 1/8 inch of skin, and transfer to medium bowl. Mash; stir in sour cream, 1 cup of the Cheddar cheese, the broccoli, bacon, salt and pepper. Fill potato skins with about 1/3 cup potato mixture each, and place filling side up in baking dish. Top with remaining 1 cup Cheddar cheese. Bake 30 to 35 minutes or until cheese is melted and potatoes are heated through. Top with chopped fresh chives. Russet potatoes vary in size and weight. Using a smaller size works best for this recipe. Buying a 5-lb bag of russet potatoes will be your best bet for getting consistently sized potatoes. These are great for serving to a crowd. Feel free to customize your mix-ins by changing your shredded cheese or type of bacon. If you thought the way to love baked potatoes was to top it with sour cream or chives, think again! 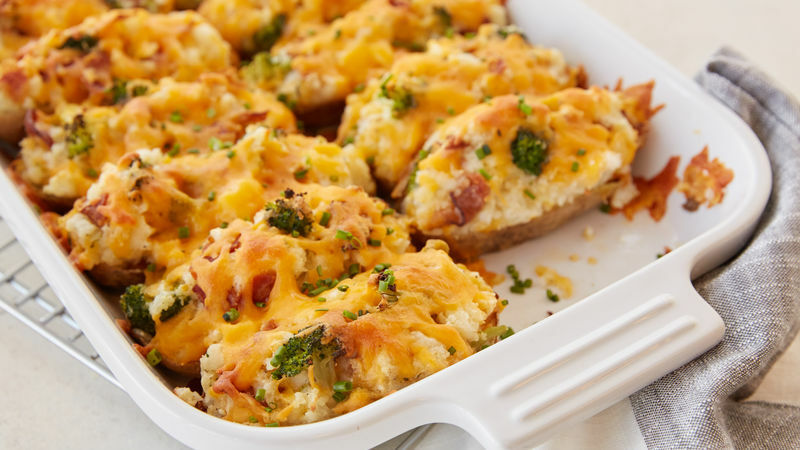 Twice-baked potatoes are the ultimate twist on a side dish. 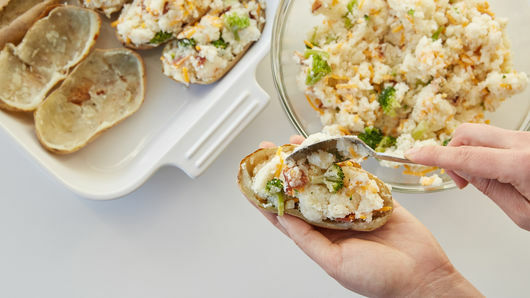 Twice-baked potatoes are sometimes called “stuffed baked potatoes,” but whatever you call it, your dinner table needs it. Although this is a cheesy broccoli version, you can really add in whatever ingredients you like. If you like your potatoes with a little kick, you can spice them up by using pepper jack cheese, green chiles or even salsa! For an Italian twist, try making a pizza version with our recipe for Twice-Baked Pizza Potatoes. 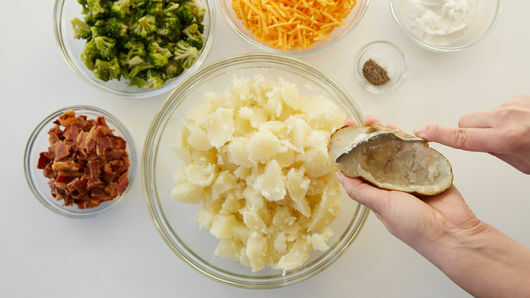 Once you master this recipe, you won’t be able to stop dreaming up brilliant ways to stuff your baked potato. To get you started, we have tons of potato recipes for you to browse through. Looking to get a regular baked potato on the dinner table quick? Here are three no-fail ways to do it.